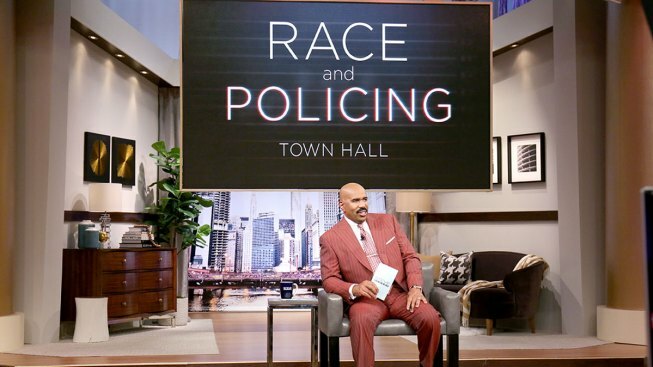 Steve Harvey hosts race and policing town hall episode. In a summer filled with violence and anger, we heard the rallying cries of "Black Lives Matter," "Blue Lives Matter" and "All Lives Matter." On Thursday’s episode of "Steve Harvey," Harvey assembles a diverse audience made up of people who want to bridge the gap, including concerned police officers and those who say they live in fear of police, along with people who are just frustrated by the national crisis and want to help work toward a solution. Harvey devotes the entire hour to having an honest discussion about the crisis, and what each and every one of us can do to bridge this deep divide plaguing our nation.